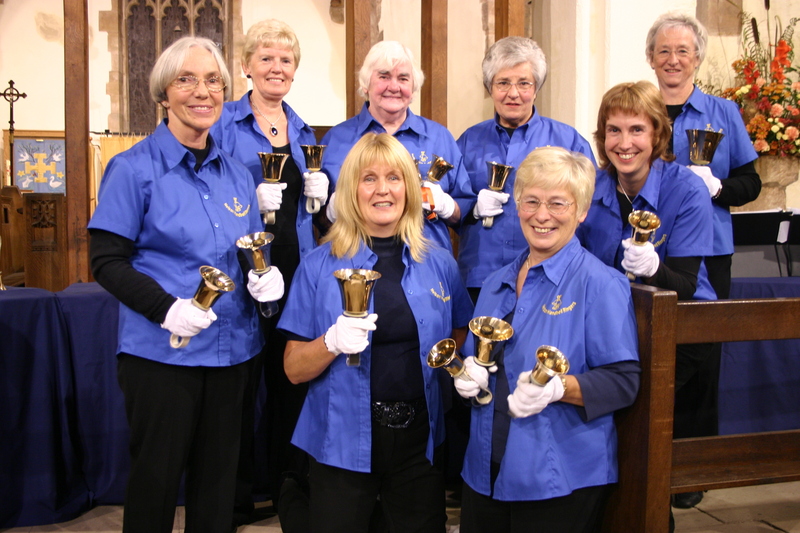 Curious to hear the Alton Handbell Ringers I went along to their concert on Saturday night in support of Cheadle Animal Welfare. It was a thoroughly enjoyable evening, with music played in a variety of styles, using chimes and drums and three octaves of handbells. It would be good to incorporate some of the techniques which they used in our own arrangements. I particularly enjoyed their Processional Celebration and the combining of Jesu Joy of Man’s Desiring with Blessed Assurance. They played English Whitechapel bells which they had gathered from various sets. It is very interesting to see the way in which handbell groups develop their own particular styles. Alton Ringers are off to York this coming weekend to size up the competition ( my choice of words!) at the National Rally, so here’s hoping that they have an inspiring time. 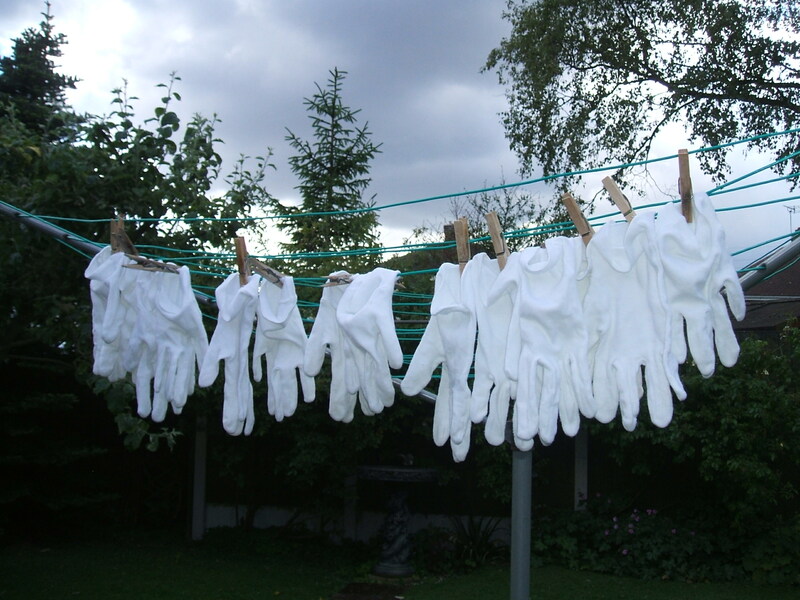 Perhaps it’s something Nelson Handbell Ringers could think of doing in future. Quite an exciting practice yesterday! Faith unveiled our new banner (they can’t miss us now! ), we had new, thicker foam pads for our tables (standing on tip-toe I can just see over the top!) and one of our team celebrated a special birthday (no names, no numbers!). Well we had a lovely evening at Wilne. We performed a varied programme of music, including ‘Somewhere Over the Rainbow’, Pachelbel’s Canon, ‘We’ll Gather Lilacs in the Spring’ and ‘Pomp and Circumstance’ by Elgar. The audience and players certainly enjoyed it! Our next ‘gig’ will be at the Royal Oak in Ockbrook on Friday 2nd December at 7-30pm when we shall play Christmas music at the ‘Christmas Tree Lights Switch On’. Come and listen to us, and see Santa arrive! We shall also play at The Moravian Church, Settlement Singers Christmas Concert on Saturday December 17th. We are honoured to have been invited by the Friends of St. Chad’s to ring the bells at their concert on Saturday October 8th. We have been practising hard and hope that they will enjoy our ‘something for everyone’ programme. 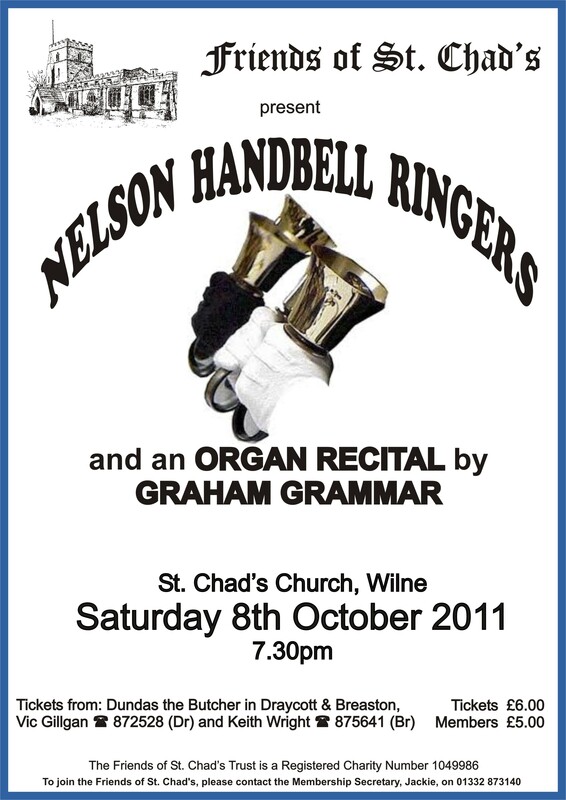 If you are in the area, why not come along and hear us and also enjoy the organ recital by Graham Grammar. Tickets are available on the door. Had hoped to have a photograph of the ringers in action at Broadway Baptist Church’s New Outlook meeting this afternoon, but was so busy ringing that I forgot to snap. However, all went well with our little entertainment and our audience joined in with gusto.O.K. one or two dropped off, but what can you expect if you play Brahms’ “Cradle Song” and “Golden Slumbers” after they have eaten a substantial lunch? After practising a little for our afternoon’s entertainment at Broadway Baptist Church, on June 1st, we set ourselves to have another go at the aforementioned Canon (OK,there are people on utube who can do it better, but we had a good time anyway! ), and then attacked a new piece, the Cumberland Reel. Watch this space! Next practice is Tuesday 24th May at 1.30. It’s really encouraging to have enough members now to be able to practise even if one or two people are missing. We had a good session last Tuesday afternoon and we’re making good progress with an arrangement of “Morning” from Grieg’s Peer Gynt suite. We’re having a little break for Easter. Next practice Tuesday 3rd May at 2.30.